MANDATORY DELAWARE NURSING CEU. Fulfills the requirement of 3 contact hours of continuing nursing education on substance abuse for DE nurses, focusing on prescription drug abuse and diversion, challenges in managing chronic pain, and best practices for prescribing controlled substances. ANCC-accredited provider; accepted by the Delaware Board of Nursing. This course fulfills the requirement of 3 contact hours of continuing education on substance abuse for RNs and LPNs in Delaware. Discuss Delaware safe opiate prescribing regulations. Over the past two decades, prescription drug–related mortality has accelerated throughout the nation, with Delaware being no exception. Drug-related overdose deaths in Delaware increased from 222 overdose deaths in 2014 to 309 overdose deaths in 2016 (CDC, 2017). Provider education was identified as a top priority in reducing prescription drug abuse and diversion in the state (DHSS-DPH, 2013). Delaware’s Uniform Controlled Substance Act (2013) regulation requires advanced practice registered nurses (APRNs) who are registered under Title 16, Chapter 47, to attest to the completion of two contact hours of continuing education biennially in the area of controlled substances, prescribing practices, treatment of chronic pain, or other topics related to prescribing of controlled substances. The Delaware Board of Nursing requires all registered and licensed practical nurses to complete three continuing education hours on substance abuse as part of the required contact hours for license renewal (Section 9.2.1.1.1). Delaware, like many other states, has been hit hard by the opioid epidemic. Delaware’s drug overdose rate across all categories of drugs increased from 15.2 per 100,000 residents in 2012 to 20.9 in 2014, while the rate of overdose deaths attributable to prescription drugs rose from 7.5 to 10.7. Of the 189 drug deaths reported in 2014, 79 (42%) involved prescription opioids and 54 (29%) involved illicit opioids such as heroin (PBSS, 2016). Delaware drug overdose deaths per 100,000 residents (Source: Rattay, 2017). More recently, significant increases in drug overdose death rates were also seen in many states, including Delaware, from 2015 to 2016 (40% increase in Delaware). Delaware is one of 22 states with drug overdose rates that exceed the national average of 19.2 per 100,000 residents (CDC, 2017). Between 2015 and 2016 there was a reduction of 5.6% in opioid prescribing in the United States overall. In Delaware, the mean daily dosage of opioids fell 26% from 2012 to 2015. Declines were also observed in the percent of patients in Delaware receiving over 100 morphine milligram equivalents, and the multiple provider episode rate in Delaware dropped by 54% (PBSS, 2016). 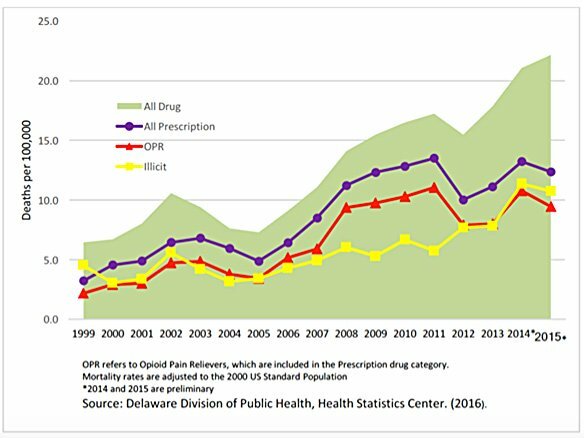 Further reductions in opioid prescribing have occurred in Delaware following the enactment of new prescribing legislation that went into effect April 1, 2017. Statistics from the Division of Professional Regulation show a 12% drop in opioid prescribing statewide from April to November 2017. The number of Delaware patients being treated with opioid prescriptions also declined 8% during this same period compared to the first quarter of 2017 (DDOS, 2017b). Delaware is one of 11 states with the highest prevalence of Medicaid enrollees with a diagnosis of opioid addiction (2,781 per 100,000) (SEOW, 2017). The economic strain is staggering from increased healthcare utilization not only for substance abuse treatment but also medical services related to coexisting diseases such as HIV and hepatitis C.
Additionally, the state of Delaware faces increasing numbers of babies born exposed to drugs and babies with a diagnosis of neonatal abstinence syndrome (NAS) (drug withdrawal in the neonate). These numbers climbed from 38 babies with NAS in 2005 to 215 in 2013, and the cost of care for NAS in Delaware climbed from $392,000 in 1999 to $9.6 million in 2013. The Medical Society of Delaware (MSD) has worked closely with the Division of Public Health and other stakeholders to assure adequate pain care while reducing the potential for abuse and diversion of prescription medication. From these efforts, MSD developed the “Guidelines for the Use of Controlled Substance for the Treatment of Pain.” These clinical practice guidelines are tailored to relevant individual practice types that routinely deal with the management of various types of pain, including acute/subacute, chronic, emergency medicine, and hospice pain management (MSD, 2013). As Delaware continues to expand efforts to curb the abuse of opioid pain medication, the Controlled Substance Advisory Committee released new rules in April 2017 to help doctors and pharmacies more closely monitor and control the use of opiates. These requirements are similar to the recommendations released by the CDC in 2016 and include expanded procedures for prescribing opiates for acute episodes of pain as well as prescribing for chronic, long-term pain management (DDOS, 2017a). These regulations are aimed at stopping addiction before it starts by controlling the amount of opiates given to new patients and aggressively monitoring their treatment. These Delaware opioid prescribing rules stipulate that first-time opiate prescriptions are not to exceed a one-week supply. If further opiate prescriptions are deemed necessary, then further action must be taken by the prescriber, to include a query of the statewide Prescription Monitoring Program database and a physical exam with discussion of relevant patient history and the risks of opiates (DDOS, 2017a). A first-time prescription to an adult patient for an acute episode cannot exceed a 7-day supply. No prescription to a minor can exceed a 7-day supply at any time. Document the condition triggering the prescription. Query the Prescription Monitoring Program to obtain a prescription history. Indicate that a nonopiate alternative was not appropriate. Administer a fluid drug screen, at the discretion of the provider. Conduct a physical examination, which must include a documented discussion to elicit relevant history, explain risks/benefits of opioid analgesics and possible alternatives, and establish other treatments tried or considered. Schedule periodic follow-up visits and evaluations to monitor progress, whether there is an available alternative to opiate use, and whether to refer the patient for a pain management or substance abuse consultation. Document the condition triggering the prescription, indicating that a nonopiate alternative was considered but not appropriate, obtain informed consent, and follow up with evaluations to monitor progress toward treatment goals. Administer fluid drug screens at least every six months. Acute/subacute pain—typically associated with invasive procedures, trauma, or disease—is the normal, predicted physiological response to noxious chemical, thermal, or mechanical stimulus; it is generally time limited. Chronic pain is a state in which pain persists beyond the usual course of an acute disease or healing of injury, or that may or may not be associated with an acute or chronic pathologic process that causes continuous or intermittent pain over months or years. Emergency medicine is the care provided within an emergency department. Hospice pain management is pain relief provided to patients in a certified hospice program where patients are terminally ill with predicted survival of 6 to 12 months. The goal is to relieve suffering and pain, not necessarily to extend life. Hospice organizations are responsible for a policy to safeguard controlled substances in the home and to educate staff on this matter (MSD, 2013). Patient evaluation: Identifying patients who are appropriate to receive opioid medications for chronic pain is necessary before prescribing any opioid medication. Treatment plan: A treatment plan should be discussed with the patient and include goals and objectives that will be used to determine treatment outcomes, such as pain relief and improved physical and psychosocial function. Informed consent: The risks and benefits of using controlled substances must be discussed with the patient, persons designated by the patient, or the patient’s surrogate or guardian if the patient is without medical decision-making capacity. Treatment agreement: A written agreement should be used between the practitioner and patient, outlining mutual responsibilities related to screening, refills, discontinuing drug therapy, and limits on where the patient can obtain prescriptions. Periodic review: Continuation or modification of controlled substances should depend on the practitioner’s evaluation of the patient’s progress toward treatment goals and objectives. Consultation: Referral to experts who can provide a higher level of surveillance and monitoring may be needed. Medical records: The practitioner must keep accurate and complete records. Compliance with the Prescription Monitoring Program (PMP): To prescribe, dispense, or administer controlled substances, the practitioner must be licensed in the state of Delaware and comply with all applicable federal and state regulations. One of the biggest challenges in healthcare practice today is how to provide safe and appropriate pain care without contributing to the widespread epidemic of prescription drug abuse and drug overdose deaths. In Delaware, the Uniform Controlled Substance Act requires all healthcare prescribers who are registered under Title 16, Chapter 47, to complete continuing education biennially in the area of controlled substances, prescribing practices, treatment of chronic pain, or other topics related to prescribing controlled substances (24 Del. Admin. Code CSA 9.0, April 2017). National Institute on Drug Abuse: Medical and Health Professional Resources provides free online tools and resources to help clinicians make better clinical decisions. Clinicians can access free drug abuse information, treatment information, patient materials, opioid prescribing guidelines, and screening tools. Delaware has never received federal funds to implement SBIRT on a statewide basis, but Delaware currently does provide reimbursement for SBIRT Services (IRETA, 2017). Prescription drug monitoring programs (PDMP or PMP) are statewide electronic databases that gather information from pharmacies on controlled substances. Growing recognition that PDMPs are a vital tool for clinicians to address the prescription drug epidemic has led to increased public and private funding to support widespread expansion of these programs. As of 2016, 49 states and Washington, D.C., have operational PDMPs, and expansion of data sharing hubs now enable 43 states to share PDMP data (ONDCP, 2016). In July 2010, Delaware Governor Jack Markell signed legislation authorizing Delaware’s Office of National Drug Control Policy to establish a database of prescription information from state pharmacies to limit “doctor shopping” and prescription drug abuse. Delaware enacted its PMP in August 2013, with the expectation that prescribers would be fully registered and using the PMP by January 2014. All practitioners that have a controlled substance registration and pharmacists who dispense controlled substances in Delaware must now register with the system. A recent evaluation of Delaware’s PMP from the Prescription Behavior Surveillance System, which reports to the CDC, showed over a 50% decline in the rate of multiple provider prescribing between 2012 and 2015. In addition, there was a 26% decline during this same period of high-dose prescriptions (over 100 morphine milligram equivalents) (SEOW, 2017). The Delaware Health Care Commission (DHCC) has unveiled the Behavioral Health Electronic Medical Records Incentive Program, a three-year initiative to support the broad implementation and integration of electronic medical records (also known as electronic health records, or EHR) systems for Delaware-based providers. As of October 2016, more than 6.4 million pounds of prescription drugs were collected through “take-back” initiatives across the country (ONDCP, 2016). Delaware currently has 21 permanent prescription disposal locations across the state and participates in an annual drug take-back event. Additionally, Deterra Drug Deactivation Systems are disseminated by multiple community agencies throughout the state. The Deterra bags are used by an individual to deactivate prescription drugs that are no longer needed (SEOW, 2017). Delaware has had increasing legislative support in curbing the prescription drug epidemic. Efforts to fight prescription drug abuse in the state began with Senate Bill 119, which enhanced Delaware’s prescription monitoring efforts. With an alarming number of prescription narcotics being obtained through emergency departments, this bill limited medical facilities from providing more than a 72-hour supply of a controlled substance. In addition, it required all controlled substances to be reported to the state PMP. This bill also addresses the prescription drug abuse epidemic in Delaware by promoting safe disposal of prescription drugs by hospice programs and their clients. This bill requires the Department of Health and Social Services to establish and implement a uniform protocol for all hospice programs operating in Delaware for the safe disposal of unused medication upon the death or discharge of an in-home hospice patient (MSD, 2014). To further strengthen efforts to ensure that patients’ medications are not diverted by family members or by healthcare professionals, House Bill 154 was signed into law. This law aims to hold people accountable who intentionally divert prescription narcotics and makes “medication diversion” a felony criminal offense, placing offenders on an Adult Abuse Registry. This bill also requires those who register to prescribe, sell, dispense, or distribute controlled substances regularly to complete continuing education in the area of awareness and knowledge of the problems posed by the abuse of controlled substances (MSD, 2014). More recently, Governor John Carney signed into law Senate Bill 111 and House Bill 220 aimed at curbing the addiction epidemic in Delaware and improving access to resources. Senate Bill 111 creates the Behavioral Health Consortium, an advisory body comprised of community advocates, law enforcement, healthcare professionals, and state leaders that will assess and outline an integrated plan for action to address prevention, treatment, and recovery for mental health, substance use, and co-occurring disorders. House Bill 220 creates the Addiction Action Committee and has the specific charge of making recommendations on a strategic approach to address and monitor the addiction crisis. Currently, there is an epidemic of prescription drug abuse, diversion, and overdose deaths not only in Delaware but also across the country. Recent governmental reports indicate that death rates from drug overdose are still on the rise despite stepped-up efforts by public health authorities. The National Center for Health Statistics reported that overdose deaths reached a record high in 2016, and with state data and anecdotal information, many experts fear this opioid epidemic has still not reached its peak.